Amazing Gold Award winners competition! The team here were all very proud to be awarded Gold in the Best Visitor Attraction category of the 2018 South Devon Tourism and Hospitality Awards. 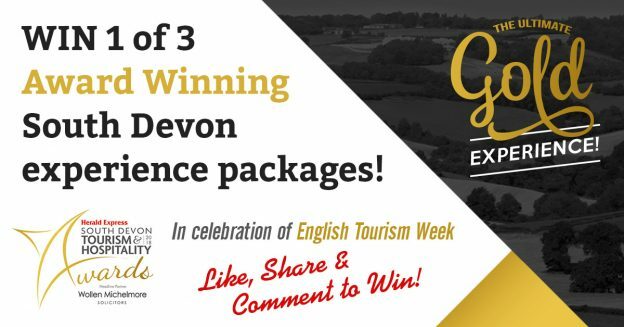 To celebrate English Tourism Week, we have teamed up with other Gold winners to offer this fantastic competition. Each package includes accommodation, dining and an unforgettable experience!!! You can enter as many categories as you like but will need a separate entry for each one. Comment on the post, tagging the person you would share your prize with and the name of the package that you would like to win eg: Romantic Riviera, Sparkling Blue Waters, Family Fun. Couples will love this romantic getaway based at the Downs Hotel in beautiful Babbacombe Bay. 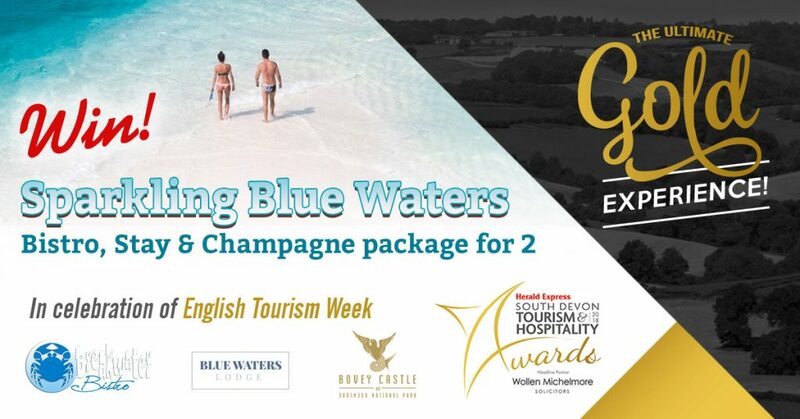 The hotel is the Gold Award winning Boutique Hotel and the winners will be treated to a relaxing two-night break in a sea view room with an award-winning breakfast. To help you unwind, a day at the Gold Award winning Spa at Ilsington Country House Hotel is included. With a beautiful Dartmoor setting, you can experience an exclusive corner of peace and tranquillity. Cuddles of the piggy variety are on offer at Pennywell Farm to complete your experience. This short break for two people invites you to begin by enjoying a delicious three-course lunch at Gold Award winning Breakwater Bistro. Excellent service, local produce and panoramic seas views should start help you to unwind ready to check into Blue Waters Lodge. 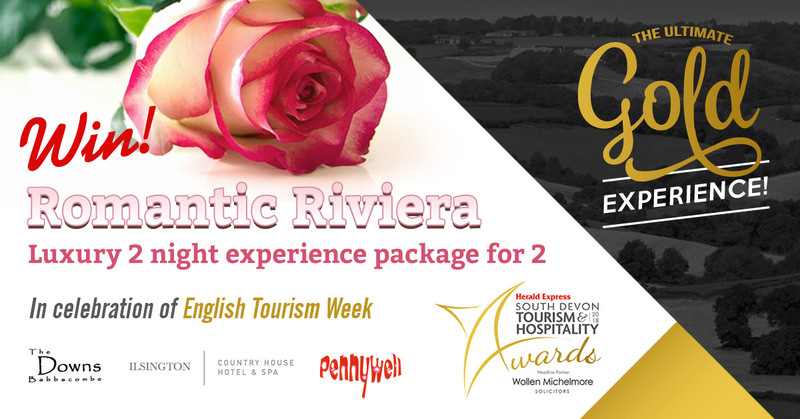 Perfect for couples, this Gold Award Winning B&B in the centre of the English Riviera offers a warm welcome, just 100 yards from the seafront. After breakfast, there’s time for a walk along the beach before check out and then it’s off to Dartmoor. Here, you can add some extra sparkle to your mini-break with a Champagne Afternoon Tea at Gold Award winning hotel, Bovey Castle. A fabulous end to your short break! This is a fabulous break for all the family in a luxury lodge with a private hot tub at Lady’s Mile Holiday Park. See for yourself why Lady’s Mile was awarded Gold for Excellence in Customer Service. Paignton Zoo and Living Coasts are Gold Award winners in Social Responsibility and Sustainable Tourism, Tourism Experience of the Year and Outstanding Business of the Year. 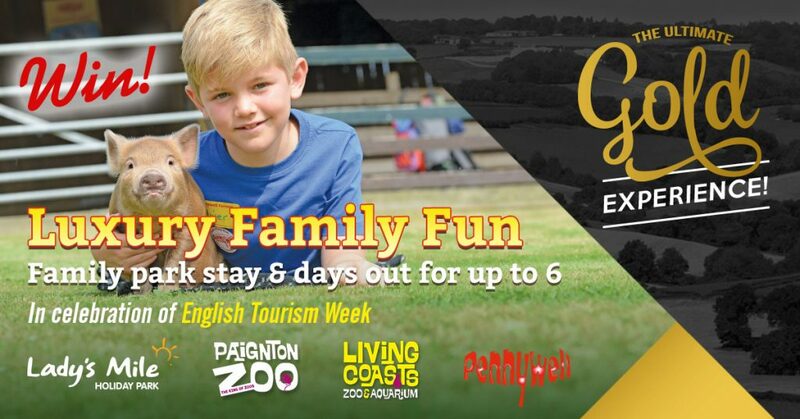 Tickets to Gold Award-winning Pennywell Farm (with lunch provided) are also included. Your only problem will be how to fit it all in! Deadline for entries is midnight on Sunday 7th April 2019. The competition winners will be drawn and notified on Mon 8 April. Entries will be pooled from all social media platforms. The winners will be announced via Social Media and on the Pennywell Farm competition website. Winners will have four weeks in which to claim their prize. Accommodation dates may be restricted to certain months. Decisions are final and no correspondence will be entered into.